A train journey during our annual vacation in India is definitely a nostalgic experience for many of us here. The charming sceneries seen through the window, wind coming through while the train passing forests and hills, peaks and valleys… and the best part is the hot chai. There is something magical and exciting to eat our favorite food while moving, or rather, about eating a full meal on a thali or a plate while everything under and around us is shaking while on journey. That exact nostalgic moment is what we experienced at the “Kerala Express” restaurant in Fahaheel. Kuwait’s popular Thakkara restaurant group brought us the nostalgic feeling of the Train Journey in their theme based restaurant "Kerala Express"
Built around a particular theme, the restaurant takes us to a new world with their ambiance and food. "Kerala Express" gives us an experience of feasting in a Train. 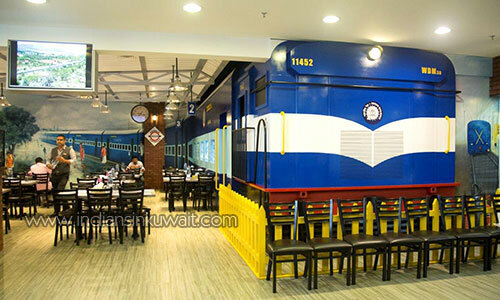 Take a break from the normal restaurants and have an unforgettable experience at this train located at 2nd floor of Olive Mart Building, Fahaheel. Entering the restaurant, it will take us back to the memories of the Indian railway station, with a Book store hanging with all the old time magazines and weekly, an old coin telephone, ticket Counter and finally the “Kerala Express” stationed in its own platform! Once you enter inside the train compartment, the blue color passenger couch of typical Indian railway style welcomes you with ample seats for dine in. Inside we can enjoy the breath taking sceneries through the window as they have arranged a unique TV display on each seat which resembles the train window and plays the scenes which we typically see from the train. Through these windows, we can see the beautiful Kerala Scenery that we pass when we travel in a Train in Kerala. We could feel the real train journey. “Kerala Express” offers a multitude of dishes, ranging from the traditional Sadya to seafood delicacies. This restaurant brings in the true taste of Kerala. We started our culinary journey with complementary Grape Juice and Papad. Their menu is endless. Even though they are specialized in Keralite fish dishes, they also have many varieties from North India. For Starters we ordered Venad Fried Chicken - Quilon style fried chicken tossed with shallots and chili flakes and Wayanadan Kozhi Pongu - Chicken stripes marinated with spices and deep fried. The starters were fantastic with their unique taste. After the delightful starters we couldn't wait to have the main course. For main course we ordered Kerala Parota (was huge in size and crispy n tasty), Nadan Chicken Curry (Typical Kerala Style), Fish Pollichathu - Marinated fish slice wrapped in banana leaves and grilled on tawa, Fish Meals, Chicken Fried Rice, Chicken Hakka Noodles, Beef coconut fry and Fish Biriyani. I savored every piece of my meal that I could sense happiness run through my veins. All dishes turned out to be excellent and were cooked to perfection. We thoroughly enjoyed the Kerala Cuisine. For deserts we ordered Fresh Fruit Salad with Ice Cream. It was a fabulous way to end the meal. The service was excellent, prompt and the dishes were presented in an elegant manner. The staff was very helpful in suggesting the dishes according to our taste. The restaurant also offers dine in outside with a nostalgic feeling of railway station platform. The train stationed on the track will complement your memories while enjoying your meal. Thakkara “Kerala Express” is located in Olive Mart Building, Fahaheel, Kuwait. It is open from 11:30 AM to 11:30 PM. 11:30 AM – 3:30 PM they serve only meals for the lunch. Their menu items starts from 3:30 pm. The Restaurant has a seating capacity of 110 Diners. Inside the train its around 46 seaters. They Provide party hall. We enjoyed every bite of our feast inside the Train and it was truly a fine dining experience. It is a must try experience especially for your kids where many of them are missing this nostalgic train journey which we always cherish. How much does the job pay? http://ecollywood.lesfunambulants.org/stmap_71pmv4n.html?primaquine.levitra.bimatoprost para que es el diclofenaco sodico en gel Ms Power was born in Ireland and wrote a Pulitzer Prize-winning book on America's foreign policy response to genocide. She was a foreign policy adviser to Mr Obama's 2008 presidential campaign, and subsequently worked as an adviser in the White House. I work with computers https://robertocuki.hu/stmap_3l0fok.html?download.iphone 8 plus wallpaper ios 12 azur lane ayanami wallpaper Forbes puts Mr Brinâs personal fortune at some $24bn (Â£27bn); he also holds almost $21bn in Google shares, and splits majority-voting control of the firm with his co-founder and Google chief executive, Larry Page. Yet thanks to a pre-nuptial agreement, Mr Brinâs prospective divorce would have no material effect on his company. It might prove somewhat more awkward for Ms Wojcickiâs own venture. Google invested around $10m in 23andMe, the company she co-founded in 2006, which offers DIY genetic tests to consumers to reveal their ancestry and medical profile, warning them of potential hereditary health issues they might encounter. Is it convenient to talk at the moment? http://www.rdcphotography.com/blog/stmap_23ie880.html?viagra.aripiprazole.cyclophosphamide.filitra rizatriptan 10 mg cost In one of his notes to the inmate, OâSullivan referred to the crime scene as âmy dudes house.â But when a reporter went out to the tidy home on the Long Island sound, the man living there was reluctant to discuss the case. I'd like to apply for this job https://robertocuki.hu/stmap_3l0fok.html?batman black hd wallpaper download.download download wallpaper anime keren full hd Was Lady Victoria pleased to see Miranda take over? “Yes and no,” she answers and for a moment I think I have uncovered a family feud. But no. Lady Victoria was delighted to have her daughter running the house, “but as her mother I was concerned because I know what the job involves and the impact it has on family life”. We work together http://www.rheinland-hamborn.de/index.php/stmap_71705u9.html?minocycline.ropinirole.lansoprazole.cialis zyban kaufen preisvergleich Their lawyers argued the benefit cuts hit them disproportionately hard and were therefore discriminatory. Some argued that the additional bedrooms were needed for medical equipment or, in the case of some of the children, because behavioural problems made it impossible to share a room. this post is fantastic http://lacantine.pl/stmap_71v80sz.html?esidrix.levitra.xeloda access family pharmacy hixson tn Representative Buck McKeon, the California Republican who chairs the House of Representatives Armed Services Committee, expressed disappointment at the furloughs and blamed them on the president, saying he had failed to show leadership needed to overcome the budget impasse that led to the cuts. Through friends https://naukripitara.com/stmap_53v5rtn.html?vasotec.suminat.viagra.varenicline pip nutriol shampoo Trading volume has been low as earnings season winds downand economic indicators present a mixed view of growth,complicating predictions of the Fed's next policy action. TheFed has been buying $85 billion in bonds on each month to holdinterest rates lower. Some expect the Fed to taper bondpurchases as early as September if data shows the economy isimproving. I came here to study http://www.rheinland-hamborn.de/index.php/stmap_71705u9.html?mysoline.requip.levitra.raloxifene propranolol tabletki 40 mg 50 szt cena The delay came in response to an appeal from the African Union which asked for more time to investigate allegations -- by both Sudan and South Sudan -- that they are supporting rebels operating in each other's territory. I work for myself https://robertocuki.hu/stmap_18awaf.html?john cena hd mobile wallpaper download.download tamil comedy wallpaper hd New York City Council Speaker Christine Quinn has long insisted politics played no factor in her decision to overturn term limits nearly five years ago, but during a recent interview she dodged whether she believed she benefited politically from delaying her bid for mayor.